The Digital Banquet is the largest networking event for digital marketing professionals in Belgium. This unique experience brings together decision makers across all areas of the industry for an exclusive afternoon that mixes great conversations and fine dining in a relaxed atmosphere. Strictly reserved to business leaders, this reception is the perfect once-a-year occasion to interact with peers, extend your network and make new business connections with highly qualified attendees. The two first editions of the Digital Banquet gathered more than 400 professionals. This year, the organisers aim for 150 participants strictly selected on the guest list. Registrations only through the official website. The Music Chapel building, a specimen of architecture in transition between Art Deco and modernism, was specially designed for its core activity: to welcome and house top level young musicians and to give them the opportunity to improve and to perform on stage under optimal conditions. 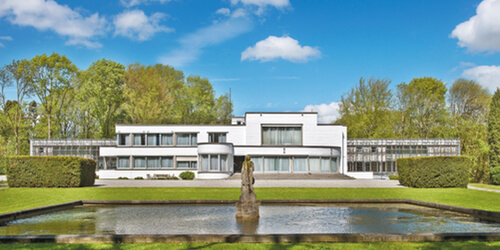 Realizing the vital importance of this architectural heritage for Belgium, the public authorities listed the original building and its park in 1994. "How can Digital contribute to build a humanistic culture?" But we do prefer the definition of Milad Doueihi, Professor of Digital Humanities at Paris-Sorbonne : « Digital humanism is the affirmation that current technology, in its global dimension, is a culture, in that it creates a new context, on a global scale ». This leads us to the idea that putting humankind at the center of our digital businesses is key for the future. A topic we want to share with the participants of the Digital Banquet 2018. Milad Doueihi is an American cultural and intellectual historian. He is Professor of Digital Humanities at Paris-Sorbonne University and Chair of Digital Cultures at Laval University in Quebec City, Canada, and Doctor Honoris Causa at UCL. He published several books among others La Grande Conversion Numérique (2008), Pour un Humanisme Numérique (2011), Du matérialisme numérique (2017). Who organizes the Digital Banquet? This event is a joint initiative between the Digital Managers Club (DMC) and the Belgian Association of Marketing (BAM). Launched in 2013, the DMC gathers more than 300 digital marketing professionals in Belgium. In addition to the Digital Banquet, this business circle also organizes monthly dinners open to the whole DMC community. BAM, is the largest marketing association in Belgium. 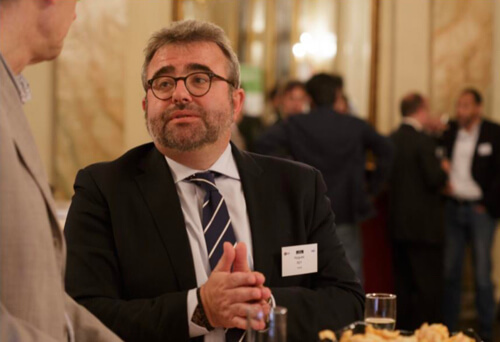 BAM is an open community that brought together members & expertises of STIMA, BDMA and IAB Belgium to create a new platform for contacts and exchanges. Advertisers and heads of digital marketing depts. Why should you sponsor the Digital Banquet? Be visible on the physical venue (display banners) and on the digital communication channels that will promote this event: official website, campaign in social networks, press releases etc. Don’t miss this once-a-year opportunity on the Belgian market ! Who, Why, where... Créée il y a plus de 10 ans par Jean-Pierre De Beys (EmailR, Tribal DDB, Skynet, Just for Business), Big Smile Agency est une agence de communication composée aujourd’hui de plus de 15 personnes. Agence ‘full service’ en communication on-line aussi bien que off-line. Ils sont rodés en campagnes de visibilité accrue avec des bannières performantes (que ce soit en bannières dynamiques ou classiques), en mini-sites d’activation (concours, événements) ou en sites web adaptatifs, optimisés pour être référencés (SEO, SEA). Demandez-leur de faire le buzz, de gérer et d’animer vos communautés en ligne, de rédiger et d’envoyer des e-mailings et des newsletters ciblées, dans toutes les langues. Big Smile se charge même de vos imprimés (dépliants, invitations…) ou autre afin de garantir la cohérence et donc l’impact de votre communication. EVO Group is a Creative Performance Digital Agency that provides a complete package of digital marketing tools and skills, ranging from Web Design to Search Engine Marketing and Mobile Development. We are structured to provide the full breadth of solutions the advertising industry needs to achieve their goals. We power the technology, data enablement, and convergent marketplaces required to ensure buyers and sellers can transact across all screens, across all data types, and all sales channels, in order to ensure the ultimate goal – results for marketers. A successful event starts with a complete website that offers an easy registration process for guest participants. If the registration process is too complex, your life quickly becomes a nightmare and the image of your organization takes a knock. With idloom-events, you have a reliable and professional tool that helps you tackle all of the key tasks that make an Event successful. You can be rest assured that Guest registrations are correctly recorded and that your participants are given a polished and professional image of your company and/or organization when you use idloom-events. In addition, idloom-events automates many mundane tasks and rids you of all the hassles inherent to Event organization; regardless of its type or size. PimpMyCompany is a Belgian company specialized in creating and support online tools to help digital publishers, marketers, community managers and digital agencies to achieve their day-to-day heroic tasks. PimpMyCompany provides the tools: PimMySocial, PimpMyClick and PimpMyLink. The leading Media Group in Belgium trust PimpMyCompany to publish online more than 150 000 contents every month. PimpMyLink is an advanced Link enhancer that simplify and allow advanced automatized tracking on all your links in order to improve all your funnels in Google Analytics or Omniture. It handles classics Google UTM parameter and also allow specific parameter-based tracking. It is has been created to track the performances of any publication the smoothest way possible. PimpMyClick is a link shortener and alias manager that allows non-developers to create and track redirection without hard knowledge. RMB is the 2nd largest advertising saleshouse in the South. It offers remarkable media solutions so that brands get noticed by their target. “Making brands shine. Giving them more visibility, more resonance, more impact, more audience…"
As a Digital Marketing Consultancy Company, Universem aims at optimizing your digital presence to acquire more audience, to convert your traffic into qualified opportunities and to delight your customers. Our teams design and implement strategies and tactics combining natural referencing (SEO & Content Marketing), online advertising (SEA & Social Media Advertising), Web Analytics and Customer Intelligence to stimulate the growth of your business. People make digital transformation happen. We recruit talent, build teams and deliver solutions.